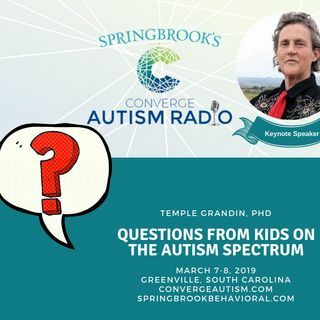 Different Kinds of Minds Contribute to Society: Discovery Across the Autism Spectrum with Dr. Temple Grandin, Author, Speaker, and Professor of Animal Science is the keynote speech to be delivered by Dr. Grandin for Springbrook Behavioral's Converge Autism Summit held March 8-9th, 2019 in Greenville, South Carolina. Dr. Grandin gave ... See More us a short description of her talk and then answered questions from our listeners! We asked the parents and kids who listen to our show to email us with the questions they've always wanted to ask Temple. Tune in for this lively discussion about computer screen time, what visual thinkers are, and how Temple felt about having the actress Claire Danes play her in the HBO movie about her life!